A weekly Tuesday evening casual ride on bike paths and quiet local roads, exploring some of the delightful paths and back streets of Melbourne for 1-2 hours. Depending on the weather there may be a stop for icecream, a swim, or maybe enjoy some fish n chips on the beach…(all optional). See facebook.com/SouthsideSeabreeze for updates. 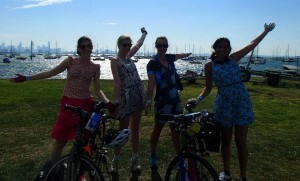 It’s open to all women as part of the Breeze program to encourage more women into cycling, so feel free to bring a friend! All bike types and fitness levels welcome. Meet outside Sandbar Cafe at 5.30pm on Tuesday. This ride will be every Tuesday during the summer months. For any questions contact Cara on 0406 946 774.